By Constantine Cavarnos 272 pgs. 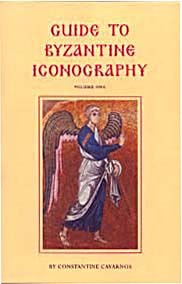 Detailed explanation of the distinctive characteristics of Byzantine iconography, of the traditional pattern of decorating Eastern Orthodox churches with panel icons, wall paintings and mosaics, and of the chief doctrinal, liturgical and festal icons; together with a concise systematic exposition of Saint John Damascene’s defense of the holy icons. Contains 74 b&w illustrations.